A man’s first hair cut in 20 years has definitely come with fringe benefits. 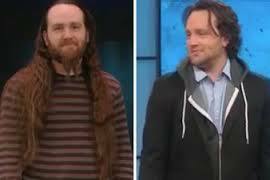 Almost two feet of hair was sheared off hirsute Roger when he underwent a full TV makeover on the Rachael Ray Show this week. Surprising his fiancee and girlfriend of 13 years, she welled up when she saw his new look. Before he came out into the studio his partner Fleur said she was excited to see how he’s going to look clean shaven, with less hair. Unkempt Roger, who last shaved his head when he graduated from high school, recently decided to give his waist-length auburn hair the chop after proposing. Banned from looking in a mirror during the dramatic restyle, Roger could not help but exclaim ‘wow’ when he saw himself for the first time. A team of stylists headed by grooming expert Kyan Douglas sheared off his pony tail, tackled his heard and eyebrows and then cut and redesigned his hair. They then updated his rocker look by swapping his baggy sweater and cargo trousers for a dapper blazer, hoodie and dark wash jeans. Commenting on his new haircut, Roger said: “Amazing….good job guys.